Middle Tennessee (7-3) at No. 20 Kentucky (7-3, No. 17 CFP), noon EST (SEC alternate). The Blue Raiders seek their first five-game winning streak since 2013 along with their first series win against Kentucky. The Wildcats meanwhile aim to halt a two-game slide that ended Southeastern Conference play. They also seek their first eight-win season since 2007. Kentucky’s offense vs. MTSU’s defense. The Wildcats haven’t scored more than 17 points since Sept. 29 and managed just seven in last week’s loss at Tennessee. RB back Benny Snell Jr. has 1,089 yards rushing but hasn’t broken 100 the past three games. An opportunity to bounce back looms against the Blue Raiders, who are allowing 406.4 yards and 26.5 points per game. Kentucky must take advantage early, though, because MTSU has outscored opponents 103-64 in the second half over the past seven contests. MTSU: QB Brent Stockstill. The senior is coming off a 352-yard, four-touchdown performance against UTEP that marked his school-record 17th career 300-yard game. He has thrown for 2,298 yards and 21 touchdowns this season. Kentucky: LB Josh Allen. 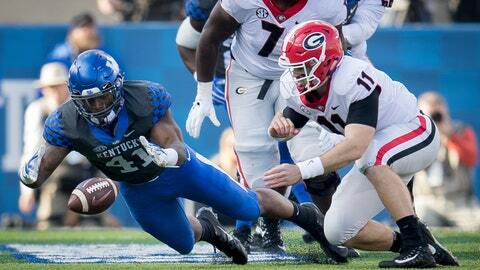 The senior leads the SEC with 11 sacks, 15.5 tackles for loss and five forced fumbles. His next full sack will tie Dennis Johnson’s single season mark set in 2001 and break Oliver Barnett’s career mark of 26 from 1986-89. MTSU is plus-8 in turnover margin the past four games. … MTSU S Wesley Bush ranks seventh nationally with four interceptions. … Snell needs 323 yards rushing to break Sonny Collins’ school record of 3,835 from 1972-75. … Sixteen Wildcats will play their home finales, including Allen. This group is one of the most successful in program history with 26 wins consecutive bowl appearances.